Dog training can be an ideal line of work for people who love dogs. This career path affords you the opportunity to work with your favorite animal while helping other dog lovers better understand their pets. No two days are alike when you work with animals, and this is particularly true for dog trainers. Dog training can expose you to a wide variety of canine behavioral problems while working in many different locations, with many different breeds, and with owners representing the full spectrum of personality types! The barrier to entry to this field is quite low, as no formal degree is necessary to begin working as a dog trainer. Many dog trainers learn their trade from firsthand experience, apprenticeships, internships, and certification programs that enhance their professional credentials. Dog trainers enjoy the perk of having a highly flexible schedule. Trainers can choose to work evenings, weekends, or regular business hours—whatever appeals to them and allows them to effectively service and maintain their clientele. Dog training can be a viable part-time career option, allowing the trainer to keep the security of working a full-time day job while offering training services on nights and weekends. Once demand reaches a sufficient level, the trainer can make the transition from part-time job to a full-time career. Dog trainers are free to set their own fees for specific services, and they can earn a solid income once they start receiving referrals from satisfied clients. A trainer can offer a variety of rate plans for private sessions, group classes, home-based evaluations, or specific specialized training options. Dog training is a great small business opportunity for those wishing to be self-employed. Many individuals have successfully launched independent careers in this field. Being your own boss allows you to set your own hours and make all business-related decisions. You can also combine other related services (such as dog walking or pet sitting) and offer expanded service packages to your clients, or develop reciprocal networking relationships with other small business owners that provide such services. There are many types of dog training, and a trainer may choose to specialize in the areas that appeal to them. Specialized options may include obedience training, dog show training, agility training, sheepdog trial training, hunting dog training, and many additional types of training. 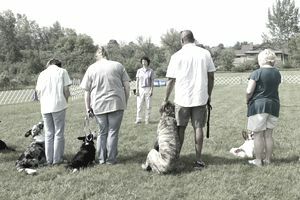 Some trainers also specialize in working with a particular breed or group of breeds. Dog trainers must utilize their problem-solving skills and their knowledge of animal behavior to determine what is causing a dog to act in an undesirable way. They must be able to figure out how to elicit desired behaviors and to correct any negative habits that present themselves. Being a dog trainer always involves a bit of detective work. The trainer can ask the owners for general information about the situation, but they must be able to rely on their own powers of observation to solve the underlying issues. There is a growing demand for dog training services, especially as owners spend more money on pet care and pet-related services (such as training). The U.S. pet industry is responsible for an impressive $58.5 billion dollars in spending according to the 2014 American Pet Product Association (APPA) annual survey statistics. The spending on pets is continued to show an upward trend for the foreseeable future. Want to Become a Dog Groomer?